Siberian Red is now in stock!! 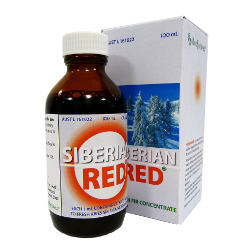 Siberian Red is a natural, dark red concentrate extracted without heat from Siberian Fir needles. Simply mixed with water, fruit juice or enjoyed as a tea, it is a great way to hydrate and benefit from its potent antioxidant properties. For those of us coping with high stress levels such as athletes or busy professionals, Siberian Red may help provide that edge against free radical induced stress. Siberian Fir (Abies sibirica) trees have developed the endurance to survive and remain disease resistant year round despite exposure to temperature extremes ranging from -55°C to +40°C and seasonal periods of 24 hours of darkness. Fascinated by the amazing adaptability and vitality of these trees, forest biochemists in Russia have researched the stress adaptation and endurance properties of the live elements (the needles) of these trees since the late 1930’s. Contained in the living material of Siberian Fir needles are a multitude of nutrients in proportions determined by nature to aid survival of the tree. Many of these substances are also beneficial to humans and readily absorbed in the water soluble form provided by Siberian Red. Take 3ml daily or as directed by your healthcare professional. Siberian Red is packed in a bottle featuring a dropper allowing the exact dose to be measured. Simply add 3ml to around 1L of water or a glass of juice. If using as a tea, add 1.5ml to 250ml of water heated to 70c.